Dmitry Bivol sparring David Benavidez to prepare for Smith Jr.
By Allan Fox: WBA light heavyweight champion Dmitry Bivol (15-0, 11 KOs) is getting in some good sparring with former WBC super middleweight champion David Benavidez (20-0, 17 KOs) to prepare for his title defense against the heavy handed Joe Smith Jr. (24-2, 20 KOs) on March 9 on DAZN at the Turning Stone Resort & Casino, in Verona, New York. Benavidez will be moving up to light heavyweight sooner or later. He’s huge for a super middleweight, and he has the punching power to compete against the guys in the 175 lb weight class. The power is there for Benavidez to move up to 175. The only question is can Benavidez take the heavy shots from top light heavyweights like Bivol, Artur Beterbiev, Eleider Alvarez, Oleksander Gvozdyk and Sergey Kovalev? If so, then Benavidez will eventually be one of the top guys at light heavyweight when he does make the move up in weight. It would be interesting to watch the sparring between the 6’2″ Benavidez and Bivol. Both guys can punch, both unbeaten, and very talented. Benavidez just turned 22-years-old last December, and will be facing J’Leon Love (24-2-1, 13 KOs) on March 16 at AT&T Stadium in Arlington, Texas. If Benavidez wins that fight, he’ll be challenging the winner of the February 23 fight between Anthony Dirrell and Avini Yildirim for his old World Boxing Council 168 lb title. Benavidez has been given the ‘Champion in Recess’ tag by the WBC after having tested positive for cocaine last September during a VADA test. Dirrell will be fighting Yildirim next month for the vacant WBC super middleweight title that previously was held by Benavidez. Since becoming the WBA 175 lb champion in 2017, Bivol has successfully defended his belt several times in beating Issac Chilemba, Sullivan Barrera and Jean Pascal. Smith Jr. falls in there somewhere in terms of talent. You can’t say for sure that Smith would beat the like Pascal or Chilemba if he fought them. We already saw Smith lose to Barrera in 2017. Whether the 29-year-old Smith would still lose to Barrera if they fought today is unknown. Smith Jr. is just now hitting his prime, and Barrera has more mileage on him from his 12th round knockout loss to Bivol last March. Smith surprised a lot of boxing fans in 2016 when he knocked out Andrzej Fonfara in the first round. Smith Jr. came into the fight as an underdog, but he took pulled off a big upset when he took advantage of Fonfara’s reckless fighting style by dropping him twice en route to knocking him out in the 1st round. Smith would later follow that victory with an eighth round stoppage victory over Bernard Hopkins in December 2016. Hopkins fell out of the ring in the eighth round, and he was injured during the fall and couldn’t continue. Smith Jr. was getting to Hopkins with his power shots at the time that the 50-year-old fell out of the ring. Hopkins opted to retire after the loss rather than push for a rematch. “Thank you [to] Joe Smith Team and Joe Smith for taking this fight. I think we will make a good fight. I will keep my belt,” Bivol said. 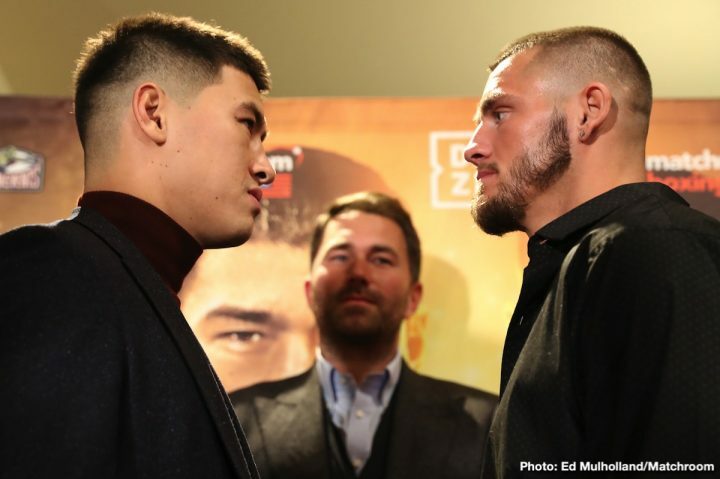 Boxing » News » Dmitry Bivol sparring David Benavidez to prepare for Smith Jr.